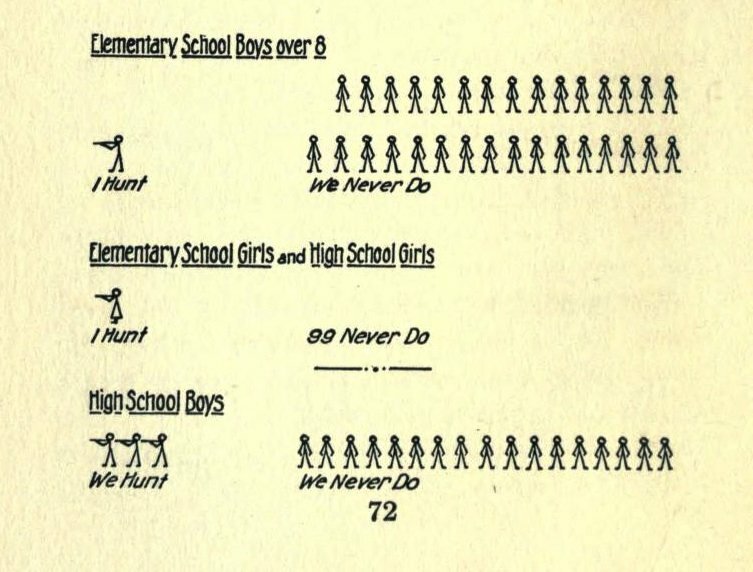 … 3171 were reported to have been playing by doing some of the following things: fighting, teasing, pitching pennies, shooting craps, stealing apples, ‘roughing a peddler,’ chasing chickens, tying cans to a dog, etc., but most of them were reported to have been ‘just fooling’ — not playing anything in particular. 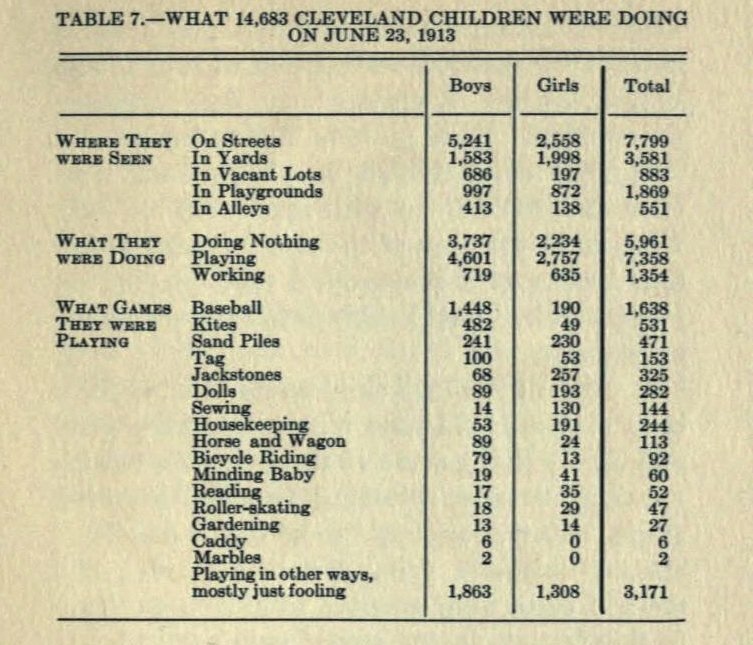 By 1916, when the two-year-old Cleveland Foundation produced Johnson’s survey of the play activities of Cleveland children, the child study and child advocacy movements had been in full swing for a few decades Education Through Recreation (which can be read in full on the Internet Archive) was printed by the Foundation’s Survey Committee. Recreation was one of a group of child-centered reports the Foundation published at the same time: “School Buildings and Equipment,” “Health Work in the Public Schools,” “Boys and Girls in Commercial Work,” “The School and the Immigrant.” The Foundation was interested in seeing how Cleveland children — in all their ethnic and class diversity — were faring, and in making recommendations for the improvement of their lot. 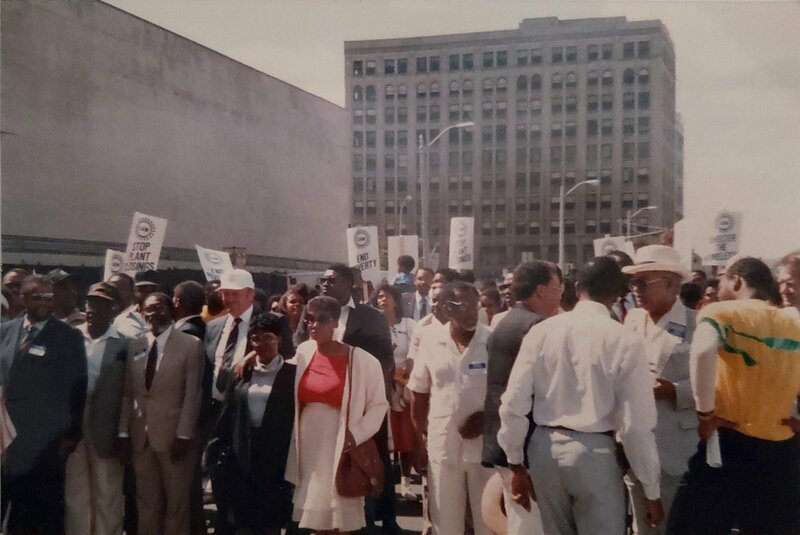 Johnson pointed out that Cleveland had already taken steps to promote physical training: the creation of a city-wide department; the hiring of school administrators who would direct schoolroom and indoor recreation; and the inclusion of recreation equipment in school budgets. Yet, he wrote, the deployment of these resources was still imperfect. Recesses were insufficiently supervised, and “children do nevertheless play games, but there is a vast deal of informal, sometimes anti-social, and relatively valueless romping and scuffling, and the recess becomes a period not of genuine social increase, but rather of social leakage.” Johnson wanted the Board of Education to change its rules so that children would be allowed to come onto the school playgrounds after dismissal and during summers. Under the current policy, he wrote, children substituted “the street, the vacant lot, the back yard, and the moving-picture show” for play on the school’s scientifically designed playground equipment. Schools should build pools and allow children in them, since, as Johnson wrote, “Cleveland has wonderful natural facilities for swimming. 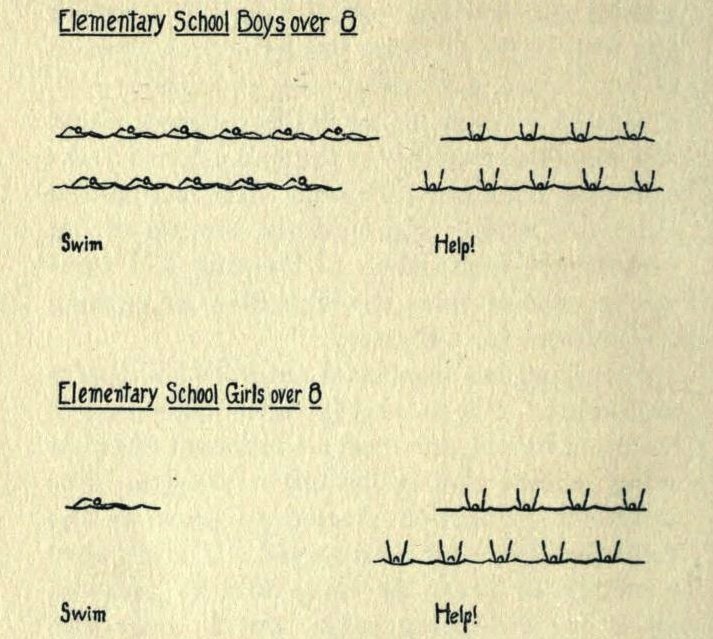 But natural facilities alone are not sufficient for the universal acquirement of swimming.” The proof was in the 1915 numbers of boys and girls who couldn’t swim — percentages illustrated in the report using charmingly crude infographics. Johnson was also unhappy about the number of boys who played baseball — which he saw as an unmitigated good influence — only in what he called “scrub teams,” or casual, loose arrangements of pickup games. “Boys should not only play baseball, but they should play on well-organized teams,” he wrote. “Scrub baseball is not the real thing. A scrub team has scarcely half the social value of a regular team.” Interestingly, Cleveland’s girls played baseball in parks, streets, and vacant lots more often than Johnson had expected — probably, he thought, because they played indoor baseball in school. Like many reformers assessing the state of childhood in cities around the turn of the twentieth century, Johnson worried that Cleveland’s children didn’t have enough contact with the outdoors, without many chances to hike, camp, and hunt. 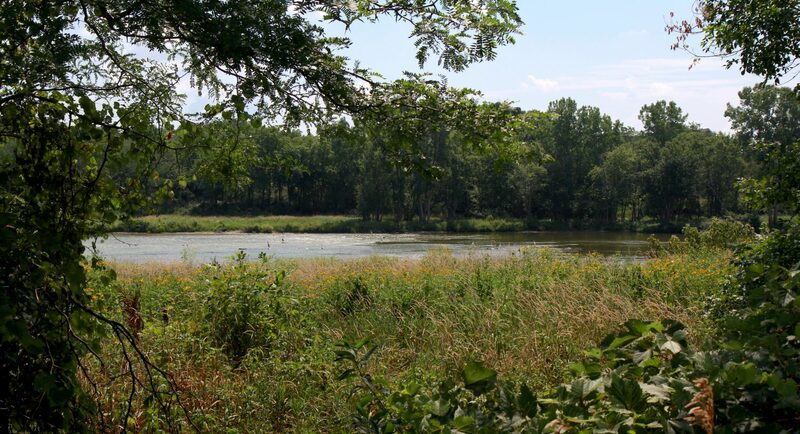 He wanted schools and organizations to find out ways to bring children out into the woods. Hunting, he argued, using language common in the time of recapitulation theory, was fundamental to human nature, part of our evolutionary background, and a necessary activity for growing children. 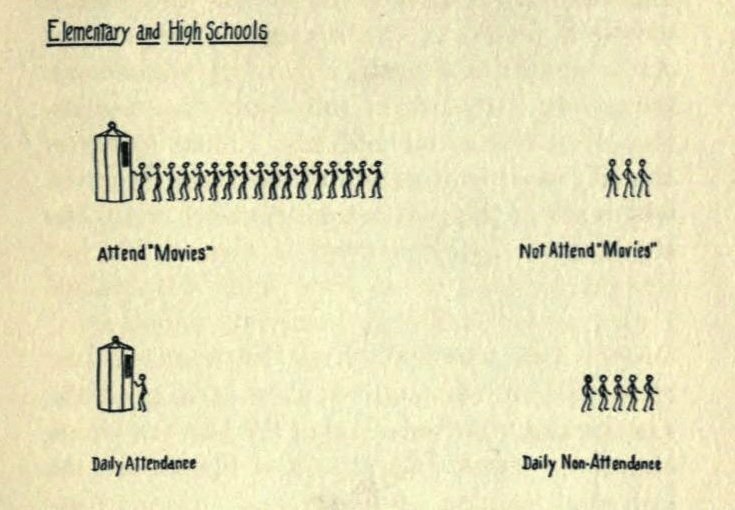 On the other hand, many schools in the early twentieth century had school garden programs, and many families grew vegetables in their backyards, so the Cleveland children who responded to Johnson’s survey quite commonly said that they had gardens: 72% of boys over 8, and 83% of girls. The questions Johnson asked, and the answers he got, painted a picture of Cleveland children cobbling together ideas about what was fun from many sources: the athletic games they participated in while they were at school; popular culture; folklore; their parents; their peers. Johnson saw this as a problem to be solved. We, on the other hand, romanticize a misty “way back when” of children’s history, full of spontaneous, undirected, screentime-free play. This treasured image of playtimes past misses many moments of danger, violence, and disadvantage. 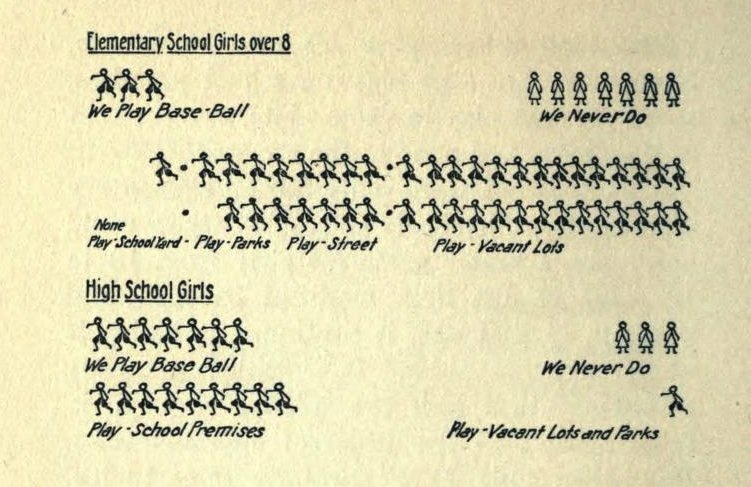 A look back at a report like Johnson’s makes it clear that our worries about play have a history. Johnson and other reformers who worried about early 20th-century recreation now seem quaintly authoritarian. 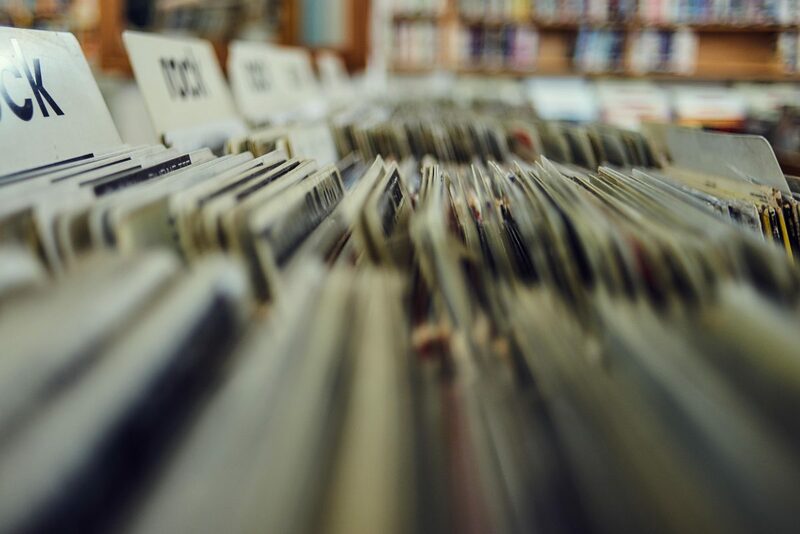 How will our own play polemics pass the test of time? Rebecca Onion lives in Athens, Ohio. She is Slate’s history writer, and runs the site’s documents blog, The Vault.